Now you can experience the Best Four Days in Gaming year ‘round with the official Gen Con® SoundSet from Syrinscape! 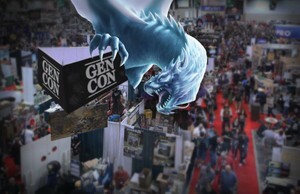 The Gen Con SoundSet transports you to the crowds and stalls of the legendary Gen Con Exhibit Hall, regales you with cosplayers and character stories, unleashes a massive monster attack on the convention, and even includes the mighty roar of the official Gen Con Dragon! Featuring more than 600 lovingly crafted sound samples contributed by Gen Con 2015 attendees who stepped up to the Syrinscape microphone, the Gen Con SoundSet is a spectacular audio oasis to keep you in the Gen Con state of mind for the other 361 days of the year, all at the touch of a button on your mobile device, PC or Mac. Special congratulations to Gen Con attendee Simon Cantwell, whose humungous and terrifying roar won out over many who auditioned to become the voice of the Official Gen Con Dragon!